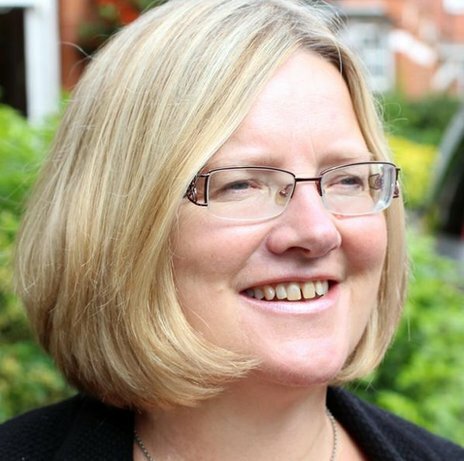 Former BBC colleagues, family and friends of Claire Prosser gathered in West London on Thursday to celebrate the life of the inspirational journalist and trainer, who died on December 1. The founder and former director of the BBC Journalism Trainee Scheme, Claire died following heart surgery after being taken ill. She was 54. In emotional tributes at the celebratory service at St Paul's Church, Ealing, long-serving Radio 4 newsreader Harriet Cass and senior newsroom journalist Dhruti Shah joined Claire's husband Paul Clabburn, a former BBC newsroom editor, in remembering a woman whose talent and personality literally changed lives. Harriet first met Claire at the dawn of her radio career in the newsroom at Broadcasting House. 'It was clear that she was going to be one of the good ones,' she declared. 'First of all she was a terrific story teller, she wrote so well and her pieces were a joy to read. And then she had a great sense of humour — and such a broad grin! She had a keen eye, she was sharp and funny. And the gossip was first rate. She could make you hoot with laughter. She remembered Claire's part in the 'quiet revolution' Radio News had started to undergo, landing an assistant editor promotion at a time when virtually all the senior journalists were men. 'Cue much rejoicing among the women in News, and to be fair, among some of the men,' said Harriet. 'But there was also some disquiet in certain quarters. It might have come from some of the disappointed male candidates - history does not relate, and I couldn't possibly comment. But Claire took it on the chin. Claire was destined for 'higher things', becoming special assistant to the head of radio news, but she was 'always grounded... she just had a better class of gossip', laughed Harriet. The journalist's lengthy BBC career also spanned Ceefax, where she became editor, and Radio 5 live's Nationwide (now Drive) and Nicky Campbell shows as assistant editor. Latterly, she ran the news sponsorship scheme and put her distinctive stamp on the Journalism Trainee Scheme she managed, championing the search for more diverse entry-level talent. The SBJ remembered a mentor and friend who didn't just hire people for the BBC, but created a support network for all her trainees. 'As each new generation turned up, she would introduce us all and whenever one of us would come across another JTS member... we knew we'd have a trusted friend in hand - after all, Claire had vetted them,' she said. She 'changed the world around her for the better' and 'never once let us down', despite her own struggles and grief. Claire's son Tom died tragically of an undiagnosed heart condition just before his 15th birthday in 2007. Claire and her husband Paul, plus an array of supporters, campaigned to raise money for CRY (Cardiac Risk in the Young). More than £90,000 has been raised since 2008 and the fund founded in Tom's memory has been renamed the Tom Clabburn and Claire Prosser Fund. Posting on the charity site last week, Paul Clabburn and daughter Ellen report that more than 1,100 young people have been able to have free heart screenings since 2009. Two more screening events will be held in 2015. Claire's former colleagues are holding a book and cake sale on Monday December 15 between 12-3pm in the third floor collaboration zone at New Broadcasting House to boost Tom's Fund and raise money for CRY. A condolence book in memory of Claire will be available during the sale on the third floor and then afterwards with Geraldine Ryan on the second floor Bridge in NBH until Friday December 19.